Burkeway Homes has recently lodged plans for 197 new homes at Trusky East close to Bearna Village. This follows the disappointment in February last when permission for a lower number of homes on the same site was refused by An Bord Pleanala under the new Strategic Housing Development process. The reason given for refusal on that occasion was that the proposed development lacked sufficient density and mix of housing types. The refusal of the previous application has given Burkeway the opportunity to bring a greater volume and variety of quality homes to the market. It will bring to the market quality new homes that will appeal to a broader range of purchaser with regard to house type and affordability. There will be something for everyone in this new development. The new application caters for families (households/purchasers) of all sizes with the inclusion of 1 and 2 bed apartments, 2 and 3 bed duplexes as well as 3 and 4 bed semi-detached and 4 bed detached homes. 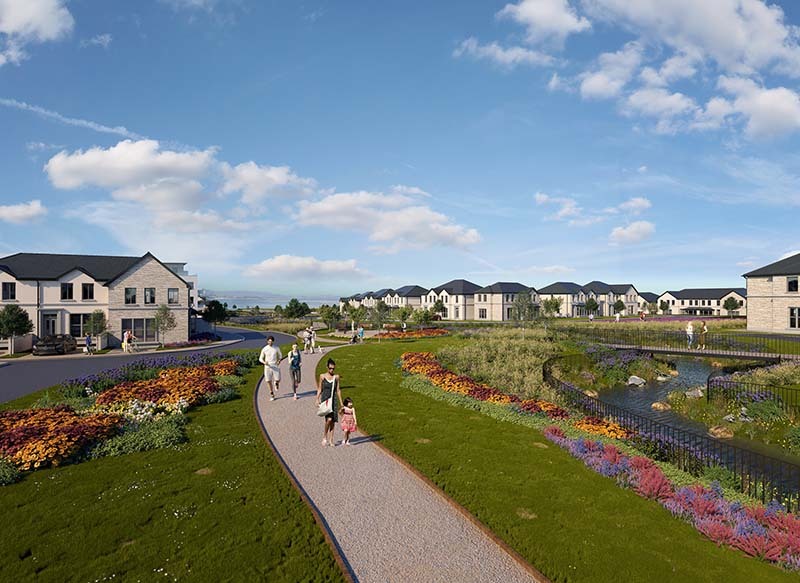 The scheme is sensitively designed around the Trusky Stream which runs through the site with homes carefully positioned to form a large open central greenway amenity space with pocket parks and playgrounds in addition to an AstroTurf playing pitch. These amenities will contribute positively to both the residents of the new development and the broader Bearna community. The Proposed development will incorporate a community room which is an innovative inclusion. This will help build a good neighbourhood spirit through providing an open and free facility for activities catering for all tastes and needs such as personal fitness, sport, parent and child, active retirement and so on. Community is very much at the centre of all Burkeway Homes projects as can be seen at the recent development at Maoilin Knocknacarra Road which includes a fabulous amphitheatre meeting point in the centre of the development with outdoor fitness equipment for adults and teenagers together with a childrens playground. Even more crucial to the Bearna community is the pedestrian pathway along the Bearna to Moycullen Road L1321 from Cnoc Fraoigh to the village that Burkeway will deliver during the first phase of construction under licence agreement with Galway County Council. The connectivity to the village is of upmost importance not just to the safety of residents already living along this busy road but also for our future residents and will help to bring the purchasers of homes in the new development closer to the heart of the community. This aspect will undoubtably prove to be a welcome boost to local businesses in the village. Burkeway has taken the learnings from An Bord Pleanala and Galway County Council Planners from both the previous application and the pre planning consultations and incorporated those into the new submission. Subject to a positive planning decision work could start on site before the end of this year with a full launch of Phase 1 of the development in early 2019. The arrival of 197 new homes in the Galway market will be welcome news to the many individuals and families desperately seeking to purchase their own home. Local estate agents are inundated with enquires in a market where nationally demand far exceeds supply with the problem particularly acute in Galway and its environs.